In a bizarre end to the two month siege of Ganfouda’s 12 Buildings complex four women and a child tried to escape in an armoured personnel carrier driven by one of them. It was stopped and the frightened occupants ordered out. Saiqa Special Forces commander Wanis Bukhamada declared the battle for Benghazi’s Ganfouda was finally over, almost eight weeks after the Libyan National Army prematurely announced a complete victory. But today’s success came at the cost of five more soldiers and a still unknown number of injured. It is now being said that 43 militants perished in the final assault, not 28 as originally reported, including two who blew themselves up as troops came near them. Bodies were pulled from the wreckage and lined up outside in the morning sunshine. Among them were Ansar Al-Sharia commanders Fawzi Al-Faydi and Salem Shatwan. The military now say it took prisoners. It is still unclear if there were other non-combatants who were found after the attack. 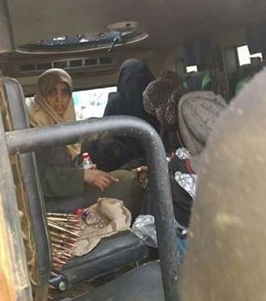 It had been reported that the militants were holding a number of prisoners to be used as human shields. It does not appear that this tactic was attempted. Soldiers discovered what was described as a mass grave. This seems to have been the spot where the militants took their dead. The LNA Mig-21 that crashed today is now understood to have been launching a strike at Sabri, which with Suq Al-Hout is now the last militant-held position in the city. The official explanation for the Mig’s loss is that this was yet another mechanical failure but some witnesses are insisting the aircraft was shot down. The pilot, named as Adel Boshah, ejected and was filmed floating down in has parachute. He is said to have been unharmed. Overnight on Friday, an unknown number of militants was killed when the boat on which they were said to be escaping Sabri was intercepted by a naval vessel. 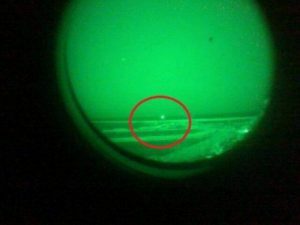 Marine Lieutenant Akram Zalgam said that the militants’ craft had been spotted with night vision equipment and sunk by gunfire. In the past it is understood that the besieged militants had managed to catch fish offshore. A picture published by the Benghazi Revolutionaries’ Shoura Council last year showed a meal which included fresh fish. 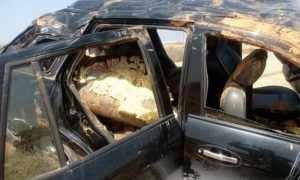 Away to the west beyond the Sidra oil export terminal, a car-bombing at Nufliya is reported to have gone wrong when the driver overturned the vehicle. Pictures show a black saloon, apparently packed with explosives, that had rolled on its roof. It is not reported what happened to the driver but LNA technicians made the device safe. The number of dead and captured militants has been updated.